Set within the charged insularity of rural West Virginia, Sugar Run is a searing and gritty debut about making a run for another life. In 1989, Jodi McCarty is seventeen years old when she's sentenced to life in prison. When she's released eighteen years later, she finds herself at a Greyhound bus stop, reeling from the shock of unexpected freedom but determined to chart a better course for herself. Not yet able to return to her lost home in the Appalachian Mountains, she heads south in search of someone she left behind, as a way of finally making amends. There, she meets and falls in love with Miranda, a troubled young mother living in a motel room with her children. Together they head toward what they hope will be a fresh start. But what do you do with your past—and with a town and a family that refuses to forget, or to change? 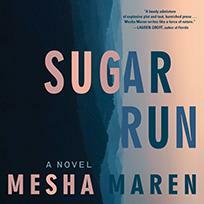 Set within the charged insularity of rural West Virginia, Mesha Maren's Sugar Run is a searing and gritty debut about making a break for another life, the use and treachery of makeshift families, and how, no matter the distance we think we've traveled from the mistakes we've made, too often we find ourselves standing in precisely the place we began. Mesha Maren's short stories and essays have appeared in Tin House, the Oxford American, Southern Culture, Hobart, Forty Stories: New Writing from Harper Perennial, and elsewhere. She is the recipient of the 2015 Thomas Wolfe Fiction Prize.